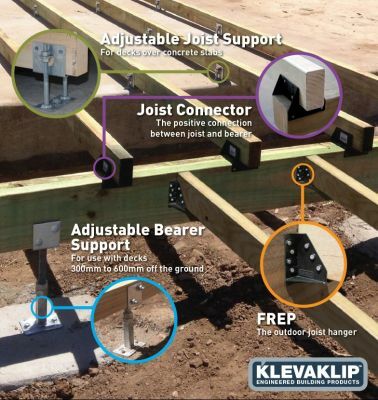 KlevaKlip is Australia's leading supplier of concealed fastening systems for decking, with custom-designed clips for ModWood, Trex Composites & 90mm Merbau decking. 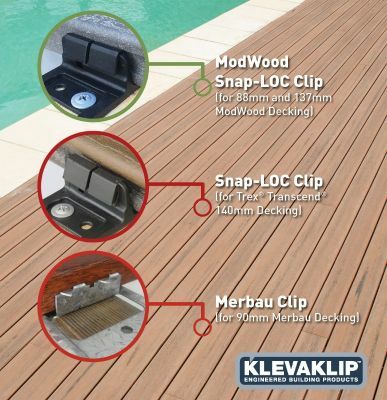 KlevaKlip also offers a range of specialised Engineered Building Products, specifically aimed at simplifying the building of your deck. Our Building Products include the Adjustable Joist Support, Adjustable Bearer Support, range of Engineered Nylon Joist Connectors and our FREP (Fibre Reinforced Engineered Polymer) Joist Hangers.